Janet Gross, an American Professor Emerita of Nursing from Morehead State University (MSU), USA, is a Registered Nurse (RN) and an ardent scientific researcher with specialization in Adult Health Nursing, Nursing Education and Transcultural Nursing. She graduated from Niagara University, USA in 1971 with Bsc. Nursing and holds a Master of Science in Nursing from the University of Kentucky. She obtained her Doctor of Science in Nursing from the University of Alabama, USA, in 1992. 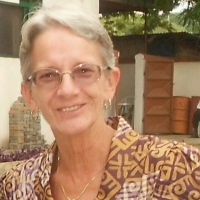 She has over forty (40) years of experience as a clinical nurse, lecturer, researcher and administrator of educational and health-based programs and has publications in renowned journals including the British Journal of Nursing, of which she is also a reviewer of articles for publication. She is an active member of the Transcultural Nursing Society, Kentucky League for Nursing, American Nurses Association, and Kentucky Nurses Association. She once served as Secretary, Kentucky Council for International Educators for ten (10) years. While at Morehead State University (1983-2008), she served on numerous committees at the university, college and department levels and chaired several major university committees including the Faculty Senate, University Tenure Committee, University Promotion Committee, and International Education Advisory Committee. Prof. Gross has also worked as an educator in other health and educational institutions in Africa and between 2012 and 2014, she served as Professor and Head, Department of Nursing, West End University College, Accra, Ghana as well as the Acting Dean of Health Sciences of the University. At the University of Cape Coast (UCC), Ghana, where Prof. Gross currently works as a Professor of Nursing, she developed the Masters in Nursing (MN) Program which was subsequently approved and implemented in the 2012/2013 academic year. She was an Academic Board Member and currently serves as Member, Board of Directors, Centre for Continuing Education and Professional Development (CCEPD) of University of Cape Coast as well as Chair, Board of Directors, 21st Century Health Foundation, Keta, Volta Region, Ghana. Her academic desire is to conduct scientific research and to help produce a caring generation of healthcare-givers worldwide with key emphasis on evidence-based practice. John Azaare holds a Master of Philosophy in Health Management and a Bachelor of Science in Nursing from the University of Ghana and University of Cape Coast respectively. He has a certificate in Leadership and Management from the Ghana Institute of Management and Public Administration (GIMPA) with several scientific sessions with the West African College of Nursing, WACN, GRNA and MDF West Africa. He has keen interest in Healthcare Research and has some of his work published in reputable peer review journals including the British Journal of Nursing (BJN). His research areas include; Healthcare Quality, Patient Satisfaction, Maternal Mortality, Nursing Leadership and Social Health Insurance. He reviews journal articles for the British Journal of Nursing. He is also done some research consultancy work in healthcare delivery for the Christian Health Association of Ghana (CHAG). John is a Registered Nurse, RN, with over 8 years experience in clinical care. He has worked in various capacities such as Clinical Coordinator, Nursing Tutor and Nursing Administrator. He is currently a Clinical Nurse Manager with the Presbyterian Health Services, Bawku, in Northern Ghana. Emmanuel Abakah, a Ghanaian entrepreneur, has strong passion for research and hopes to become a Research Consultant focusing on Financial, Economic and Social Research. He obtained his Bachelor’s Degree in Statistics with Computing from the University of Cape Coast in 2010 and continued to the University of Ghana, Legon for his Master of Philosophy in Finance. While undertaking his postgraduate study at the University of Ghana, he served as a member of the Finance and General Purpose Committee under the University’s Finance Board and was once the Secretary of the Graduate Students Finance Committee, Legon and a member of the National Audit Committee, Graduate Students Association of Ghana (GRASSAG). He is actively into providing financial and investment advisory services to groups and individuals. Based on his strong quantitative research background, analytic and data management skills, he conducts training workshops for Small and Medium Scale Enterprises (SMEs), Microfinance Institutions and other organizations. Emmanuel also conducts customized based research tailored to meet the needs of companies and teaches Research Methods, Quantitative Methods, Research Writing Skills, Financial Mathematics, Principles of Corporate Finance and Financial Econometrics to both graduate and undergraduate students on private basis in Ghana. He is currently taking a Professional Accountancy program with the Institute of Chartered Accountants, Ghana to become a Chartered Accountant.